The Raspberry Pi camera provides a 5 megapixel resolution with still images of up to 2592 x 1944 and multiple video modes including 2592 x 1944 at 15 frames per second. With it being mounted on a small board it is ideal for using in hacks. [Josh Williams] mounted the camera on the lens of binoculars to capture some startling images, including this squirrel. The camera is installed on a custom, laser cut mount that fastens to one eyepiece of the binoculars. The Pi itself is mounted above the binoculars. An LCD touch screen from Adafruit allows [Josh] to select the image and adjust the focus. Snapping pictures is done using either the touch screen or switches that come with the screen. The Instructable [Josh] wrote is extremely detailed and includes two different ways of mounting the Pi on the binoculars. The quick and dirty method just straps on with tape. The highly engineered method delves into Inkscape to design a plywood mount that is laser cut. For portable operation, [Josh] uses one of the ubiquitous battery packs meant for USB charging. Basic setup of the Pi and camera are in a video after the break. It may seem trivial at first, but the effect [Dan] gets when using binoculars as a telephoto lens is surprising. The images are well in focus with great colors. This technique not only brings your subject mater closer but also provides a depth-of-focus feature not normally available on simple cameras or camera phones. The proof is in the example footage found after the break, but you’ll also find a video tutorial detailing the build. [Dan] already had the expensive components are a pair of mini binoculars and a Kodak Zx3 pocket camcorder. The camcorder is the same form factor as a smart phone so using different hardware will be a breeze. He started off by building a prototype out of paper. Basically it’s a bracket that properly aligns the camera with one lens of the binoculars. Once he had everything lined up he transferred his measurements to some sheet metal. The bracket for the binoculars is attached to the one for the camera using bolts and wing nuts to make it adjustable. One important part of the design is to gut a hole for access to the binocular focus wheel. Here’s an oldie but a goodie. [RunnerPack] stumbled upon an article from 2001 about building a stereo microscope from a pair of binoculars and a camera lens. With a ring light attached to the end of the camera lens, we couldn’t think of a better microscope for SMD work. 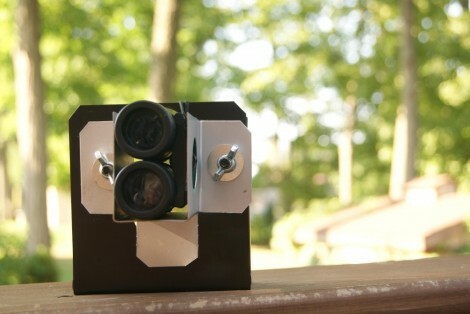 To mount the binoculars to the camera lens, [Giorgio Carboni] made a very nice adapter containing four prisms. These prisms are very carefully aligned and glued down with a little bit of epoxy. By using an 8×30 pair of binoculars and a 35-100 mm camera lens, [Giorgio] was able to get a magnification factor of 10-57x. With a macro lens this factor can be increased (a 28mm lens bumps it up to 71x, but a lot more light is needed). The pedestal is just a few ground rods and ground steel rods, something that requires a bit of machining. Since 2001, though, a lot of tinkerers have 3D printers so it could be possible to build a more easily manufactured version of the focusing apparatus. [RunnerPack] had a pair of binoculars and a camera lens handy and tried a mono version of this build. He says he was blown away, but unfortunately didn’t provide any pictures. If you decide to build this project, be sure to snap a few pics and send it in on the tip line. 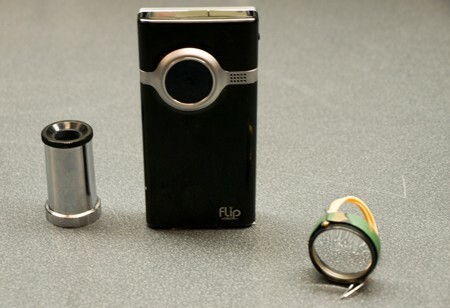 Flip cameras are fun and easy to use, but not particularly versatile. If you’ve had poor results at macrophotography with a Flip, you might be interested in these DIY lenses. One is macroscopic lens for taking photos and video of small things, and the other is a microscope for even smaller things. To construct the macro lens, you’ll need a pair of binoculars, some rubber bands and paper clips. Simply remove the lenses from the front of the binoculars, complete with the plastic casings that hold them. Thread a rubber band folded in half to the plastic casing and hold it in place with small segments from the paper clip. Now place the lens in front of the Flip’s lens and secure the rubber band around the flip. The microscope’s eyepiece uses no such attachment method, simply hold it in front of the Flip. The same process can’t be used here because getting the proper focus requires it to be held at varying distances from the camera, not flush against it like the macro lens. In any case, it’s any easy mod that should have you taking pictures of bugs and other tiny things in no time. Look after the break for video of the lenses in action.